Looking for help? Let our friendly Customer Service team be of assistance to you, located in the mall management offices. Do you have a question right now for our Customer Services team? Ask them at 518.561.8660 extension 123. Do you need to contact Champlain Centre’s security team? Looking for your favorite shopping, dining or entertainment destination? Visit or directories located at the mall entrances. Print directions are also located on the downloadable directory here. We offer ATMs located in various areas across the property. You can find each one highlighted on the directories found here. Strollers are available for free. Strollers can be found at main mall entrance by Target and Best Buy . Lost an item at Champlain Centre? Please see Customer Service, located in the mall management office by the food court and Regal, or call 518.561.8660. Please see International Currency Exchange near the food court, for currency exchange needs. Wheelchairs are available free of charge, at Customer Service, in the mall management offices. Please see Customer Service representative for details. 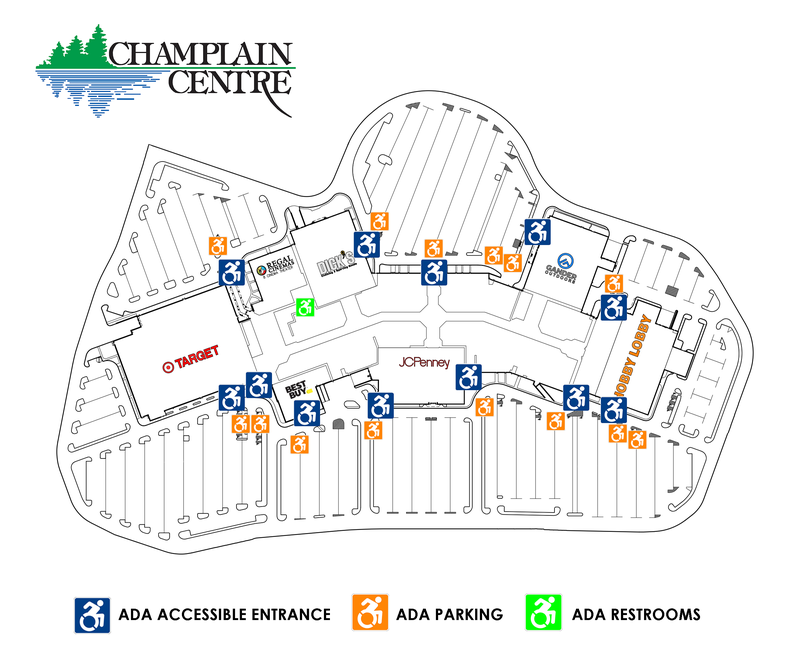 Champlain Centre is committed to serving our special needs customers and providing accessibility all throughout the mall. ADA accessible entrances are identified below and ample parking is available throughout the site. Thank you for shopping at Champlain Centre. Effective May 31, 2012 Champlain Centre is a tobacco free property. This policy is inclusive of the entire property both inside and outside, including all entry points, hallways, loading docks, parking lots and construction areas. In addition to cigarettes, the policy is in effect for cigars, pipes, electronic cigarettes and other similar substances or instruments that are lit burning, or any tobacco use in general.